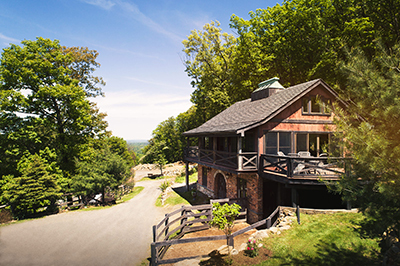 The Equestrian Suite is a secluded guest suite perched above the horse stalls at Lambs Hill. 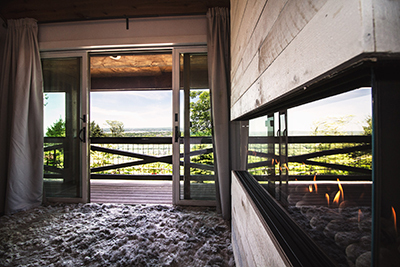 This romantic and private suite provides wedding weekend accommodations for couples getting married at the venue, and it is also available to book on Airbnb. 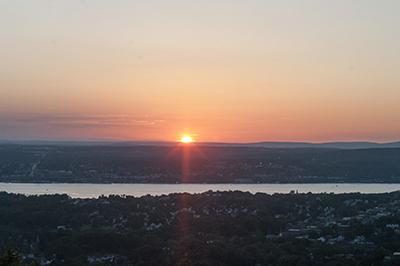 With over 100 5-star reviews and Superhost recognition, this rental is the ultimate Hudson Valley romantic getaway. 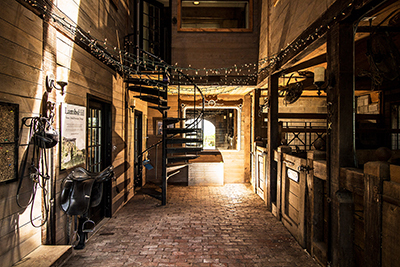 Through the center aisle, past the horse and donkey stalls, and up the spiral staircase, the Equestrian Suite awaits you. 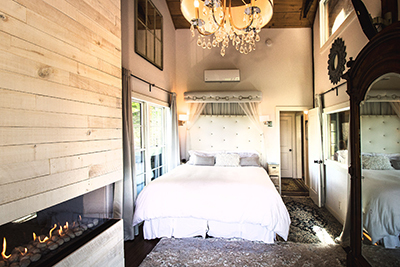 This high-end vacation rental is designed with rustic-chic glamour throughout and includes: 1 bedroom with California king bed and gas fireplace, a spacious living room and kitchen area, a loft with queen bed, and a full bathroom. On the wrap around balcony and north and south deck, you'll find an outdoor 7-person hot tub, Weber grill, and seating for the exclusive use of the suite guests. The romantic bridal-inspired bedroom has a king bed, modern 3 sided gas fireplace, and glass sliders to a covered balcony with river views. 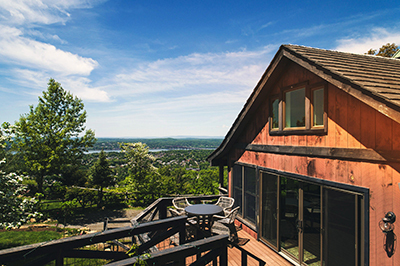 The side window has mountain and horse ring views. 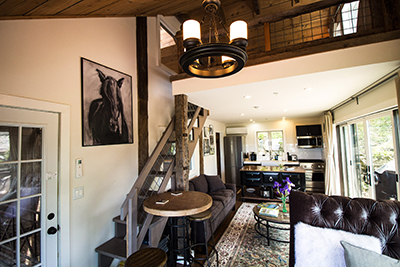 Vintage reclaimed barn wood adorns the vaulted ceilings. Relax in bed, watch TV and enjoy the romantic fireplace, or check out the window that peeks down into the horse and donkey stalls. 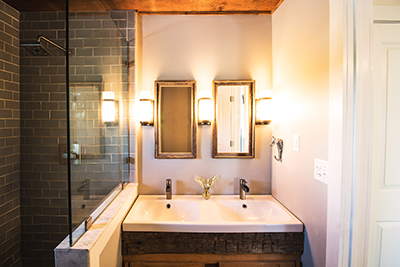 The spacious bathroom has a double sink and walk-in shower lined with handmade subway tiles. The living room/kitchen area has a seating area for hanging out and watching Direct TV (including Sunday Ticket) or movies on the DVD player. We have a selection of games and movies for the guests. 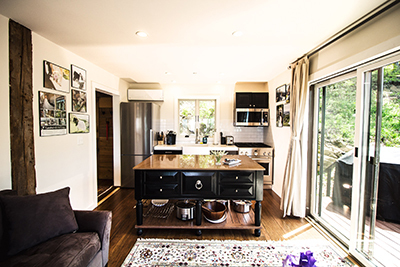 In the kitchen, amenities include; new professional gourmet stove, microwave, crock pot, toaster, and Keurig coffee maker. We provide complimentary coffees and teas, fresh eggs from our chickens, as well as pantry items such as microwave popcorn, smores kit, granola bars, and pancake mix. Sliders in the living room lead to the south deck with Weber grill, outdoor table, and seating. Sliders in the front open to the covered balcony which lead you around to the north deck with the hot tub. 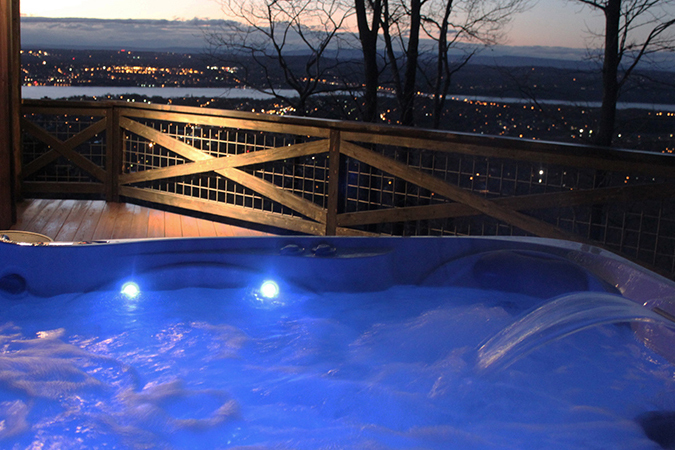 Enjoy a glass of wine soaking in the private hot tub while watching the sun go down and the lights below begin to twinkle.